Michael van Gerwen kept up the pressure on top of the table Rob Cross, after hammering Michael Smith 8-3 at Liverpool’s M&S Bank Arena on Thursday night. Mighty Mike averaged 109.11 in a contest that was a repeat of last year’s final and soon, racinginto a 4-0 lead. Smith finally entered the contest in the fifth, striking back with the first of two 12-darters, the second of which only came after MVG had collected an additional two legs for himself. There was one more leg for Bull Boy before MVG sealed the win with checkouts from 76 and 80 to keep the heat on Cross before their top of the table clash this week. It’s Voltage who remains in first place after defeating Peter Wright 8-5 despite suffering from a recent bout of tonsillitis. Having pulled out of Sunday’s Players Championship event, there were fears that the Hastings thrower would also miss out in Liverpool. These concerns proved unfounded, much to Snakebite’s misfortune, who now finds himself one off the bottom. Cross averaged 102, the eighth time in 11 matches that he has recorded a three figure average, while Wright banked just over 100. Cross took out 140 as he marched into a 3-0 lead and before long found himself up 6-2 after he finished with 105. Snakebite threatened a comeback by taking three of the next four legs before Voltage sealed victory with an 11-darter. The 2018 World Champion has now won seven out of his last eight games to retain his cushion ahead of Michael van Gerwen as he moves closer to securing a playoff spot. Gerwyn Price moved into a playoff position after leapfrogging Mensur Suljovic in a poor quality affair in which neither player averaged higher than 90. Hitting just two maximums each and failing to produce a checkout above 100 between them, this scrappy match was one to forget. Stretching his unbeaten run to three, The Iceman won’t be too bothered as The Gentle’s challenge begins to fade after a poor couple of weeks for the Austrian who was this week shot down 8-5. After falling behind 3-0, Suljovic struck back with four legs on the trot before Price reeled off four of his own. Then they split the final two legs to give the Welshman the points. Third place in the table belongs to James Wade after he bagged a point courtesy of a 7-7 draw with Daryl Gurney. The Machine was forced to fight back from two down on three separate occasions when at 3-1, 4-2 and 5-3. But after hanging in the game he looked the more likely to emerge victorious as Gurney needed to take the decider to draw level, something he achieved with a superb 10-darter. Wade averaged 90 compared to 104 from Superchin, who will regret his eight missed doubles in one leg while ahead 5-3. That was where the game turned as Wade took three legs on the spin before Gurney hit back with an impressive 11-darter. Following his draw with James Wade, Daryl Gurney has continued to stutter in recent weeks but should get back to his winning ways this week in Cardiff. Superchin lines up against Mensur Suljovic, who came off worse in a scrappy match last time out against Gerwyn Price. Neither player is currently in the top four, and in truth neither look as though they will be unless they find form and soon. There are only five weeks remaining, but going by past results, Suljovic has lost both Premier League meetings with Gurney, a record that will likely be stretched to three. Match two is the big one, Michael van Gerwen versus Rob Cross in a meeting of the top two. Mighty Mike is unbeaten in four matches and easily pushed aside Michael Smith last week. If anything, it was MVG’s best performance in the league so far this year, which is good timing as he takes on Voltage who is also in the form of his life right now. Overall, Cross has a poor record against Van Gerwen, save for the 2018 World championship semi-final. The Dutchman has won 13 of their 16 meetings, winning all four of their Premier League showdowns, so the smart money goes on him. Next out are Gerwyn Price and Michael Smith with The Iceman expected to bully the Bully Boy in front of his home crowd. The Welsh former rugby player has responded to a run of three straight defeats with a three match unbeaten run, including almost toppling MVG a fortnight ago and beating Suljovic last week. Smith, on the other hand, has been poor all year and is now a point adrift at the bottom of the table. Last year’s runner-up has won 12 of their last 17 matches, but Price is in form and will, for once, be cheered by an enthusiastic home crowd in Wales. The night’s final action sees James Wade take on beat Peter Wright who has struggled badly in the Premier League this season. Wade, third on leg difference, shouldn’t have any need to worry here as the real Pete Wright is still yet to stand up and it will soon be too late. Away from the Premier League, Snakebite’s form has been superb, claiming three PDC titles in eight days, but the league is the big thing in darts right now and there his form has been appalling. The same thing can’t be said about The Machine who will fancy his chances of banking a win here and so do we. This week’s Betway Darts Premier League acca is as follows; Daryl Gurney, Michael van Gerwen, Gerwyn Price and James Wade which pays at 20.87/1. In a reception normally reserved for the likes of departing rock stars rather than Darts players, Raymond van Barneveld was treated to a hero’s send-off in Rotterdam last Thursday. Barney’s final Premier League Darts season, from which he had been relegated one night earlier, ended with a heavy 7-1 defeat to fellow Dutchman and former protégé Michael van Gerwen in Rotterdam. We knew going into the match that this would be his farewell performance in the tournament, an event he won in 2014, as he was due to retire at the World Championships in London in December. Such a heavy defeat, however, coupled with such a glorious show of love from the 10,000-strong Barney Army, led an emotional Barney to announce his immediate retirement on home soil after the match. However, 24-hours later, after reflecting on his decision, Barney has decided that the lure of the Ally Pally was too strong and that he has decided to reverse his decision and fight on after all. Happy times for his devoted fans. Barney’s relegation from his last ever Premier League campaign was assured on Wednesday after he was thrashed in another 7-1 defeat, this time by Daryl Gurney. In his match against van Gerwen, he found himself in very real danger of a whitewash after MVG stormed into a 4-0 lead, which would have been an even sorrier end for the people’s champion. But, much to the relief of his legion of followers, he finally got a leg on the board when Mighty Mike missed tops in the next. That was Barney’s only strike of the night as MVG threw for the match shortly after. Daryl Gurney’s hot streak continued in the night’s opener as he beat Mensur Suljovic 7-3 to record his third Premier League victory in a row. Only a few weeks ago, Superchin was languishing down near the bottom of the table but now finds himself on a four-game unbeaten run that includes last Thursday’s shock win over Michael van Gerwen. The Northern Irishman’s latest win, in which he averaged 98.28 compared to Suljovic’s 91.58, means he now has 11 points heading into Belfast on Thursday night. Gurney’s victory never really looked in doubt, despite having his early 2-0 lead pegged back by The Gentle, who soon found himself down 5-2 before long. Just as he had one night earlier, Suljovic hit a 12-darter that suggested he could mount a fightback similar to the one that beat Rob Cross on Wednesday but he instead went on to miss eight shots on double allowing Superchin to take all the points. The Price was Wright for Gerwyn in match three where The Iceman shot down Snakebite 7-5. Peter Wright is fast becoming the player to end other players’ bad runs of form. Gerwyn Price used the occasion to end a run of three straight Premier League defeats and hopefully breathe new life into his flagging play-off challenge. Price will now be looking to Daryl Gurney, who is on a horrible stretch of his own in which he lost 7-0 and 7-1. He then played Wright, drew, and has since reeled off four straight wins to find himself fourth in the table. Here, the Welshman averaged 94.47 compared to Snakebite’s lowly 87.6 as he cruised into an early 2-0 lead. Wright, though, closed the gap and before long had moved ahead 5-4. The Iceman was level again by the sixth before returning in the next to bank at least a point for himself. Wright then missed the two darts that would have let him get away with a draw — much needed after his 7-1 mauling the night before — before Price pinned tops to take the spoils. 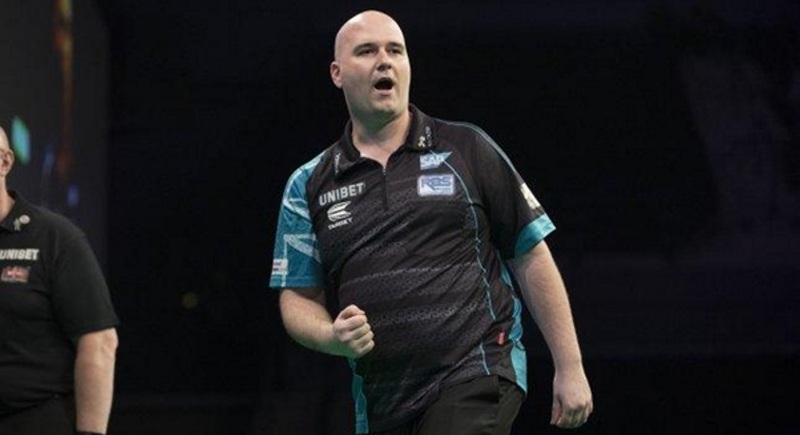 Having stumbled a night earlier against Mensur Suljovic, Rob Cross dug deep to get his title campaign back on track against the final of our contenders, Jeffrey de Zwaan. The young Dutchman, who received overwhelming support from the 10,000-strong Rotterdam crowd, began his night’s work with an 84 checkout as part of a fearless 12-darter, before finishing from 151 to stun Voltage into an early fright. After Cross pulled a leg back, JDZ immediately replied with yet another 12-darter, which this time included a deuce of 180s to restore his two-leg cushion. At 3-1 down, 2018 World Champion Voltage began to fight back by winning five legs on the spin to silence the vociferous Dutch support. De Zwaan, nicknamed The Black Cobra, managed to pull one back, but like each of the other contenders, was unable to win as Cross got the job done in the next, courtesy of his eighth 180 of the match. In the final match of the night, James Wade came back from 3-1 down to defeat Michael Smith 7-4 and move up into third place in the table. 2018 runner-up Smith almost opened with a nine-dart finish but missed the final shot only to claim the first leg on his return. The Machine responded with a 12 darter of his own before Bully Boy took the next two legs in just 27 darts. Wade took over by reeling off three straight legs of his own. Although Smith briefly equalised, The Machine ran away with the match thereafter. The race for a Premier League play-off place continues in Belfast on Thursday, and having said goodbye to Raymond van Barneveld and the last contender, we’re down to the final eight. The first of our four matches sees James Wade take on Mensur Suljovic with The Machine only too aware that he does not have a good record against Suljovic. In fact, Wade has only won five of their previous 15 meetings and has already he was beaten in this campaign by The Gentle 7-3 in Nottingham during Night 6. Wade is playing with confidence right now and beat Michael Smith a week ago so will fancy his chances of breaking his duck against the Austrian this week. Suljovic will be looking to bounce back from his defeat last time out in Rotterdam. He was at least able to record a win in the first of last week’s two games when he came from behind to beat Rob Cross. I suspect he will come good again this week as well. Michael Smith is out next in his match against Peter Wright. With the league shrinking by two places, Smith — runner up last year — narrowly avoided relegation last week but still finds himself occupying the bottom space and will hope that a match against Snakebite can halt that slide. Victories against Wright have worked wonders for both Daryl Gurney and Gerwyn Price and could prove to be the catalyst for Bully Boy too. Wright is second bottom himself having not won in four outings, and he has not beaten Smith in his last three Premier League games. I don’t see that changing here. Next up are Daryl Gurney and Rob Cross. 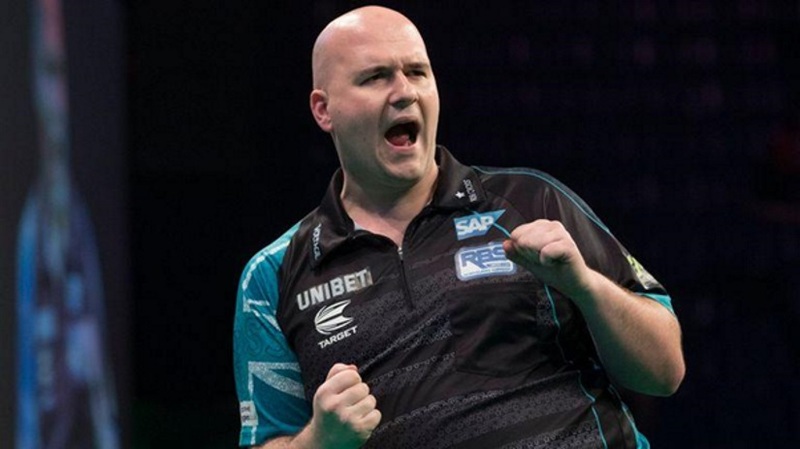 While Gurney is on a hot streak, having seen off competition from van Gerwen, van Barneveld and Suljovic over the past three Premier League nights, Rob Cross is one of the few players capable of challenging MVG for top spot. One dodgy result aside, he is playing like best in the world right now. It’s true that the Northern Irishman will be hard to stop in front of his home crowd, but I think Voltage should have too much in this particular meeting. Finally, we would expect Michael van Gerwen to beat Gerwyn Price in the last of the night’s action. Mighty Mike was all action back home in Holland last week, winning both of his matches 7-1, and regaining top spot in the process. Price, on the other hand, ended a slump of three straight defeats by beating Snakebite but has lost each of his 15 matches against the Dutchman and that might well be a slump too far. A four fold accumulator with the online bookmaker Betway placed on Mensur Suljovic, Michael Smith, Rob Cross and Michael van Gerwen all to win pays out at 16/1.